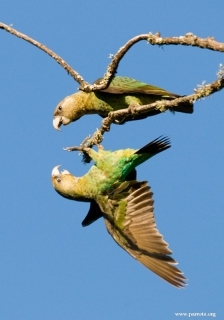 The Cape Parrot was once the nominate of the species Poicephalus robustus. It is now considered to be a separate species. Both adults have varying plumage; head and neck dull olive/golden, scalloped with darker brown; orange/red band across the crown in female (absent in males); dark green back and wings; green rump and underparts (tinged with blue); orange/red thighs, bend of wing, and carpal edge; black/brown tail; dark brown eye; white/grey eye ring (bare); and horn-coloured bill. Green to yellow/brown head and neck, body dark green/olive. Orange markings lacking in all juveniles. Head may appear silver after 9-12 months. Loud, very vocal, including five distinct calls described as tzu-weee, zu-wee, zz-keek and a nasal zeek. Piercing series of screeches emitted in flight. Softer sounds of contentment while at rest. Voice similar to Meyer’s Parrot but more grating. Captive birds mimic human and other sounds. Parrots of the World, Forshaw and Cooper, 1989. Walk-in aviary, minimum length 2.1m (7 ft), or indoor cage minimum length 1.8m (6 ft). Cooked beans and pulses, boiled corn; sunflower, dry, soaked or sprouted; walnuts greatly favoured, fruit, especially apple, orange, banana, rearing food made from: hard-boiled egg, wholegrain bread and carrot, all ground to crumbly consistency; fresh vegetables such as: carrot, celery, green beans and peas in the pod; complete pellet. Bathing; foot toys, destructible (non-toxic) toys such as wooden block, vegetable tanned leather and heat sterilized pine cones; non-destructible (non-toxic plastic) toys, food-finder toys, preening toys, different texture and size hanging perch toys, fir, pine, elder or willow branches, push-and-pull toys (sliding up and down), vegetable tanned leather toys. Threatened by habitat loss, illegal capture for the wild-caught bird trade, and persecution as a crop pest. Endemic to eastern Republic of South Africa, from Eastern Cape Province to southern KwaZulu-Natal, with an isolated population in Limpopo Province. High altitude Afromontane mistbelt yellowwood-dominant Podocarpus forest patches above 1,400m (4,200ft). Prefers Podocarpus seeds, which make up about 70% of their diet. They have also been recorded feeding on apples, plums, cherries, acorns, pine seeds, and Eucalyptus flowers. Feeds in trees only, preferring fruits high in the canopy and then moving down. Birds roost communally in flocks of up to 20 in large Eucalyptus or Podocarpus trees. Food nomadic that travels vast distances (up to 100km) to preferred feeding sites, often staying for weeks to exploit food resources. Mainly arboreal, Cape Parrots come to the ground only for drinking. September-December, but has been recorded in May.